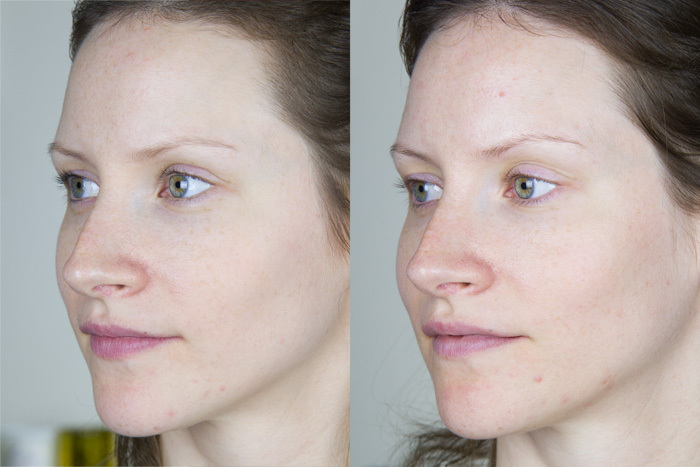 This is my honest review of my experience with the Halo Hybrid Fractional Laser Treatment. All photos were taken using controlled studio lighting, in the same location and using identical camera settings each time. As I'm sure you can see straight away, there really isn't much of a difference between my before and after photos. I would be lying if I said I wasn't a little disappointed with my results, but I think there are a couple of things to keep in mind when deciding whether this is the right treatment for you. We used a Visia machine to determine my true Skin Age before the treatment and then again at 6 weeks after. Before the treatment, my skin age was 24. After the treatment, my skin age was 27. I don't know how accurate this machine is, but this info along with my before and after photos should give you a pretty good guideline for my results. So first of all, I want to start out with my positive results. Please keep in mind that you start seeing results 3 days after the treatment, but full results are seen 6 months later. The biggest result I have seen to date (now 4 months in) is a complete elimination of my acne scarring around my chin. I used to have a lot of texture in that area that was especially obvious when I would wear foundation. The makeup seemed to sit in the crevices and I would always go straight to that area to Photoshop my blog photos without fail. I hadn't noticed that I wasn't needing to do that anymore until very recently and I think this is one of the results that gets gradually better over time. It's very difficult to see this from my photos below, but to me it is so obvious. The next result I have noticed is a complete change in my skin type. I used to have very dry and dehydrated skin, but now I would actually call it normal to oily. This may also have something to do with it being summer at the moment but I actually find my skin getting quite oily throughout the day. To some people, this may sound terrible, but after having such tight and flaky skin for so long, it is such a relief to have some moisture in it. Also, oily skin ages much more slowly than dry skin, so I'll take it! Continuing on with the change in skin type, I can see a bit of change in the hue of my skin. 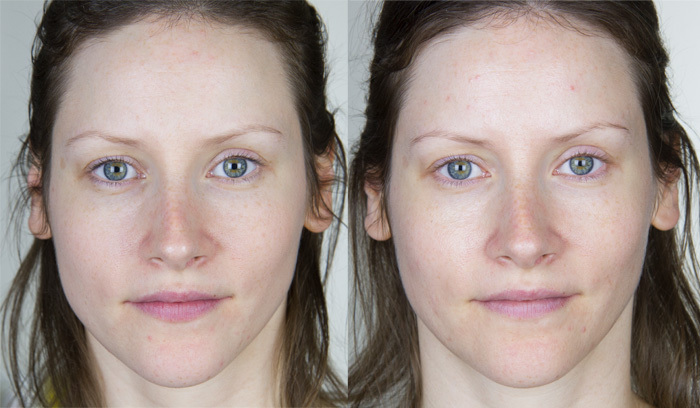 You can actually see in my before and after photos that my skin was quite yellow and dull looking on the left, while on the right it is a little pinker, brighter, and quite a lot more radiant. I am using the same moisturizer in both and had been following the same skincare routine throughout the entire process. I feel like my skin looks somewhat younger and more youthful on the right and almost like I'm wearing a subtle highlighter. This is a bit of a cheat because it is a result from a quick zap with an IPL Laser, but my sun spot on my right temple is a lot lighter. I had no result on this spot from the Halo, but one zap of IPL worked wonders. I think one more treatment in this area will completely fix it. So now, onto the not so great results. One of the things that is advertised about this laser treatment is its ability to dramatically reduce pore size. And to be honest -- after the 8 day mark, I had noticed an extreme diminishment of pore size, but unfortunately that didn't last for more than a couple of weeks. 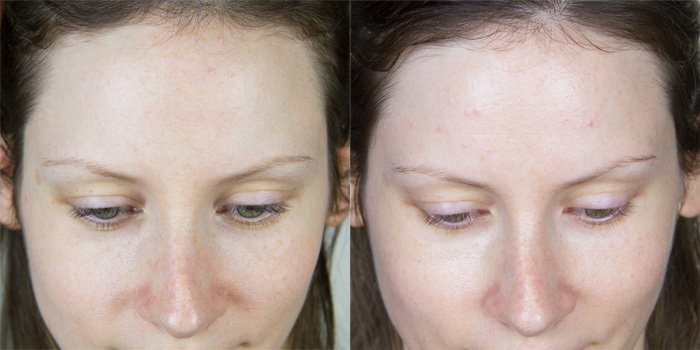 My pores went right back to their normal size by the time that I had my six week follow-up and the Visia machine actually showed results of lager pores than before. I had mentioned this to the tech and she said that pore sizes have a lot to do with genetics and the machine cannot change your genetic makeup. This is more than likely true, but I felt a little led to believe that I would get results in this area. After my initial follow-up (which was 10 days in), I had mentioned how happy I was with my smaller pore size and she raved about how the Halo was so great for this. Then, when I came back in for my 6 week follow-up and said that they had gone right back to normal, she said the thing about genetics. It's fair enough reasoning, but I would have liked to know this before raving about my new pore size in this video. I had absolutely no reduction in sun damage or redness in my skin. This is apparent from the photos, but was even more confirmed with the Visia machine that is specifically designed to see all the damage that the naked eye can't. When originally testing for my "skin age" with the Visia, this was my biggest problem area. I have fair skin, a lot of freckles and love the sun so it really shows in the sun damage category. The Halo gave me zero results in this area even though this is one benefit they claim on their website. 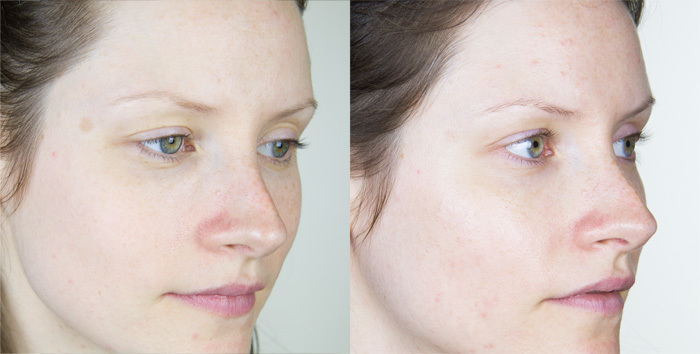 I have had IPL laser treatments in the past that gave me amazing results on my sun damage and redness, to the point that it completely eliminated beauty marks that I had for my entire life with one treatment, but I did not see a single result from the Halo. As I mentioned before, when the tech zapped my sun spot on my right temple with the IPL in a follow-up appointment, I finally saw a reduction in the color. One of the results promoted about the Halo is the increase in collagen production. The tech and I were hoping this would mean that I would see a bit of plumping in my cheeks, but unfortunately this was not the case. I'm not devastated about this one, as I wasn't really expecting a miracle here, but I thought it was worth mentioning. The lines on my forehead have had absolutely no reduction. I actually feel that they are more apparent in my "after" photos due to the shininess of my skin. Since then, I have been using an eye cream on my forehead that seems to actually be doing the trick, but I did not see results from my Halo treatment. Oil production increased in my skin, which to me is not a bad thing for the most part, except that my acne has gotten much much worse since having the treatment. I can't say for sure that this is a direct result of having the Halo treatment, but the timing is pretty exact. The Visia results had shown this increase in oil production as well (adding to my new skin age), and I am noticing breakouts in new areas that I didn't have them before -- forehead, between the brows, cheeks and neck, adding to the already existing breakouts around my chin. These photos from 2 months ago are actually a lot better than what I'm dealing with now. After going in for my 6 week follow-up, the technician said that my skin was too good to see any real results from this particular treatment. I really don't know what to say about this, but what I do know is that before the treatment, she said that I was a great candidate and that I should see incredible results. One large factor to keep in mind from my results is that my treatment was done at 10% intensity. I was told by the technician that she chose this setting because she felt that this was all the heat that my skin could handle. In all honesty, I was pretty happy that she had done such a low setting because I found it to be very painful, but in reflection I feel that this may be why I didn't get the results I was expecting. I'm not sure if it's comparable, but my IPL was done at 40-60% intensity and yes it did hurt, but it was bearable and the results were worth it. Again, I can't say for certain, but I do have feeling that my treatment simply wasn't aggressive enough. If you go into your treatment with this information, perhaps you can have a chat with your technician to determine what sort of results you can expect. Do your research and check out reviews from sources that aren't sponsored by the clinics that administer them. I do feel that there is potential here, especially from the results I saw in the reduction of acne scarring, but I simply can't honestly rave about it. Based on my personal experience with the Halo Hybrid Fractional Laser, I cannot personally recommend it. With a price tag of $1500, I don't feel that the results were worth the cost. If your skin is at all comparable to mine, I would suggest going for an IPL and saving yourself $1200. Both treatments are usually suggested to be used as a series of 3-6 treatments, which means that you could be saving yourself up to $7200! This alone would be my personal deciding factor. omg crazy how $ the treatment is! I have been suffering from hormonal acne and I am 32. I am going to a clear skin place on Friday because I am so sick of having to deal with this every month. Thanks for sharing your results! Thanks so much! I was totally considering this since I've had the BBL and didn't see any results with one. Perhaps I'll give that one more shot first. Girls Weekend | Digital Nomad Plans!